The 13A 1-gang socket outlets with 2.A USB also now feature a new location for the USB port – from underneath the switch on the right, to above the socket outlet on the left. 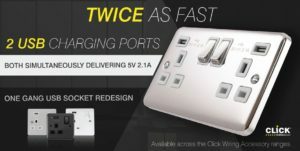 The new-look, upgraded 1 and 2-gang USB sockets are available in all Click ranges – Mode, Polar, Deco, Deco+, Definity, Define and Metalclad. Mode, Deco, Deco+ and Polar USB sockets can be fitted into a 25mm back box. Definity and Define USB sockets require a 35mm back box and Metalclad USB sockets are supplied complete with a 40mm back box.